I accosted someone at the bookstore yesterday. 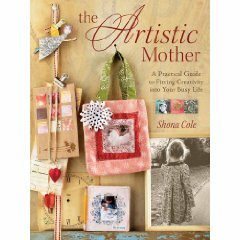 I had run over to get a quick peak at Shona Cole's new book, The Artistic Mother. I fell in love with the projects, her voice throughout the book, and the wonderfully encouraging contributing artists. So when I noticed someone else standing there perusing some of the same books and we started chatting, I had to tell her all about Shona's amazing book. It's funny cause I am not a salesperson by nature, but when I find something worth feeling enthusiastic about I can't stop sharing it. It feels like such an amazing find. I'm excited too because I've been anticipating Shona's book for some months now. Ever since North Lights Facebook staff starting posting links to her blog and teasing us with allusions to her book. It was so hard to wait. The absolute best part of it though is that the book is BETTER than I'd even imagined. The projects are new and unique, the techniques are all things I want to try, and the inspiration and encouragement is deep. I was also completely delighted with the connection Shona illustrates between writing and art. Better still she shows how you might use your writing to inspire your art. I noticed that some of her projects had a functional component as well. We moms are busy and yet want to be surrounded with beauty and creativity and Shona features a handmade calender, to-do sheets, planning tips, and other motivational ideas in her projects. Love love love this book. Can't wait to snuggle in this weekend and read it thoroughly. I'm also very grateful to Shona for taking the time to share in book form her how-to experience on being both a Mom, and an Artist. Writing a book is amazingly time consuming and I'm in awe that this mother of five was able to do it and do it so well. I got my copy of this a few weeks back and it is wonderful! I have it with me every night at work and haven't tired of looking through it. The stories of the other artsy mom's are gentle reminders that we are not alone in our quest to find creative time in our ever busy lives as mothers and wives. I really enjoy Shona's style too!